Member of the Melli Council of the Saint Mark Coptic Orthodox Cathedral Mohsen George called on the Egyptian authorities to file a lawsuit in the International Court of Justice against Israel to restore Deir al-Sulatan Monastery in Jerusalem, especially since the Egyptian Coptic Church possesses documents proving its ownership of the monastery, besides court verdicts by the Supreme Court of Israel in favor of the church. “This monastery belongs to Egypt and we have documents and evidence proving our ownership of the monastery, as well as Israeli judicial rulings, which are not respected by the Israeli government itself,” George told Al-Masry Al-Youm on Wednesday. He explained that Deir al-Sultan is an archaeological monastery for the Coptic Orthodox Church located inside the walls of the old city of Jerusalem, in the Christian district next to the Chapel of St. Helena and the Chapel of the Angel. The monastery is about 1,800 square meters. It was returned to Coptic Christians by Salah Eddin al-Ayuoubi, after he defeated Crusaders. It has been known since then as Deir al-Sultan, said George. Deir al-Sultan is of particular importance to Coptic Christians because it is their direct way to get from the Monastery of St. Anthony, where the headquarters of the Egyptian Patriarchate lies, to the Church of the Holy Sepulcher, according to George. George said that the Egyptian Church hosted in Deir al-Sultan Ethiopian monks for over three centuries. The Ethiopian monks attempted over years to take advantage of any tension between Egypt and foreign authorities that supervised the monastery, including the Turkish, British and Jordanian authorities, to take control of the monastery, said George. The Ottoman Sultan Abdul Hamid had ruled that the monastery belonged to the Coptic Orthodox Church. During the War of Attrition, Ethiopian monks coordinated with the Israeli occupation authorities and expelled Egyptian monks from Deir al-Sultan in April 1970, after which the Egyptian Archbishop of Jerusalem filed a lawsuit with the Supreme Court of Israel to restore the monastery. On March 16, 1971, the Israeli Supreme Court condemned the Israeli government after the attacks on the Coptic clergymen were proved and returned the monastery to the Orthodox Church. Another ruling by the same court issued on January 9, 1979 ordered the handover of the monastery to the Egyptian Orthodox Church, according to George. On Wednesday morning, the Israeli occupation forces arrested a monk among the participants in a protest organized by the Coptic Orthodox Patriarchate in Old Jerusalem, as well as a number of other monks and participants, while the Patriarch of the Coptic community stood at the entrance of the monastery in an attempt to prevent the entry of workers from entering amid the cheers of protest. Israeli occupation forces have beaten Coptic monks on Wednesday in Deir al-Sultan Monastery in Jerusalem during a protest against preventing the Coptic church of Egypt from doing restoration works in the monastery. The monks were opposing Israeli-led-restoration works in favor of the Ethiopian Copts who have been disassociated from the Coptic Church since 1970s. The Israeli police dragged and pinned to the ground the Egyptian monk Macarius Orshalemy before arresting him at the protest, the Coptic Orthodox Patriarchate in Jerusalem said. The Israeli government decided to take a permit from the Ethiopian Copts to implement the restoration works, ignoring the church’s offer that it would pay the costs of the restoration works. 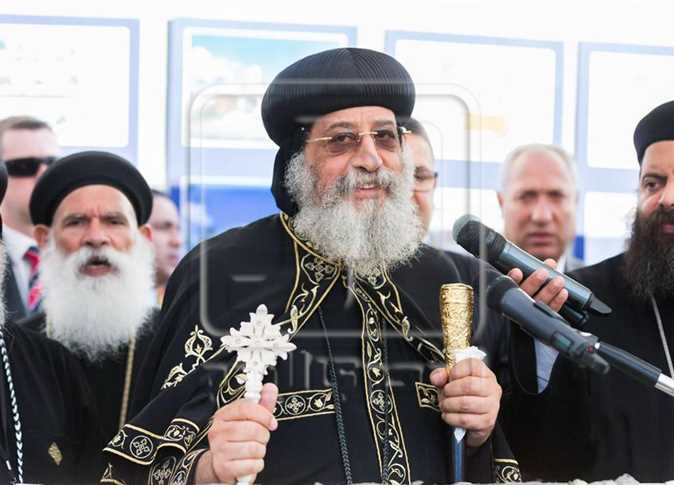 “They refused to let us renovate and repair the chapel inside the monastery in order to show that we don’t have any relation with the place and that it belongs to the Ethiopian monks, Coptic Bishop Antonius told the newswire Middle East Eye. Official spokesperson of Egypt’s Ministry of Foreign Affairs Ahmed Hafez said that Ministry of Foreign Affairs “denounces the Israeli attack on [the Coptic] monk,” revealing that the ministry managed to release the arrested monk.